This brevet interesting by road along Moscow-River. In addition it start and finish near Moscow. I will try to give sufficient description. Brevet “To the edge of love” (organized by the bike club “Caravan-Marathon”) was held on September 5 2015. The route is considered as very good, for the last couple of years this brevet held the third time. In addition this “Edge-Bluff-Cliff-Precipice etc… of Love” is the aim of lot of”simple-ride routes”, the smaller on distance, and not only on the asphalt. Link to track (opens in a new tab). “Bluff of love” is a high bank of the Moscow River behind the village Troitskoye (Trinity) at 135-th kilometer of route. Named apparently by bicyclists 10-15 years ago, because many simple-ride routes settles the main place for rest here, also it is the aim of the route. History of the name – typical legend about love and death of young virgin. From 125-th km to finish route goes along the Moscow-River, for better visibility I’ve increased size of the Moscow-River on the map. From Zvenigorod to Moscow, this area has the second name “Moscow Switzerland,” which may also given by cyclists in 1950s. The roads are a continuous hills and turns. As I have heard many cyclists go by train to Zvenigorod in weekends and ride back of to Moscow by bikes. At the profile of attitude it can be noted quite a large sum height of 1900 m, and a fairly large vertical drop – 114 m. On the chart one can see like two shelves placed at different heights. At first, after the first 5 km one climb on the “top” shelf, while at 125-th km drop to the bottom one, it’s just the route along the Moscow River. 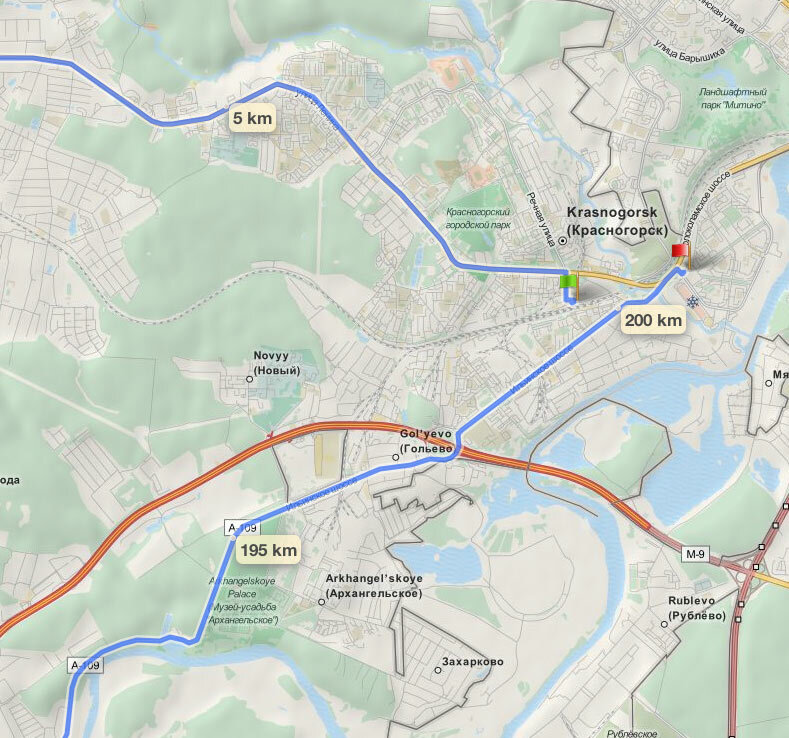 The first 50 km of the route is on well profiled Volokolamsk roadway. This highway is quite habitable, many traffic lights. However, “Volokolamka” is sufficiently well suited to ride off from Moscow on the bike, not on the train. On the 82-nd kilometre at T-shaped intersection with the road Ruza-Tuchkovo turn left to Tuchkovo. The road becomes more mountainous with the feeling that going uphill all the time. On both sides really it becomes like an Alpine valley. Many of the hills and the villages in an Alpine style. 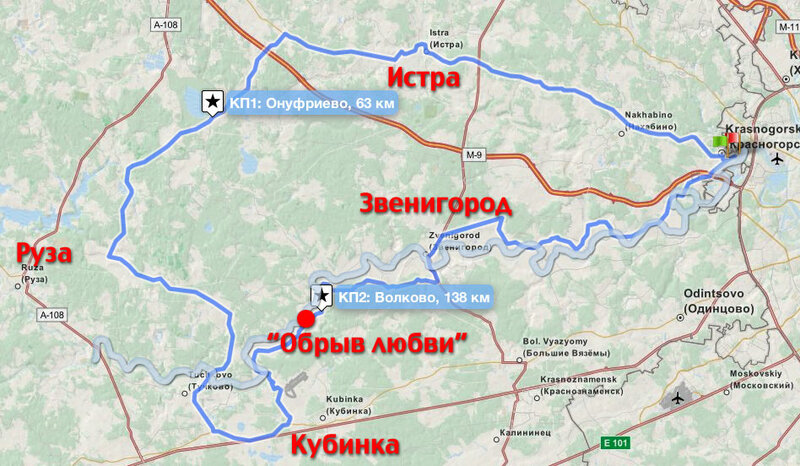 Such sur continues 15 kilometers (82-96-th km), then turn to Tuchkovo near Kolyubakino. 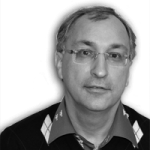 Firstly it located habitable resort area near Moscow-River, and then begins Tuchkovo city. At quite difficult to understand the T-junction you need to turn left to the sign “Mozhayskoe shosse”, while the main road goes according to the sign goes to Ruza again. Immediately begins a road like after the bombing. The total length of bad road is not long, and getting smaller. Abrupt transitions to the cover with fresh asphalt. 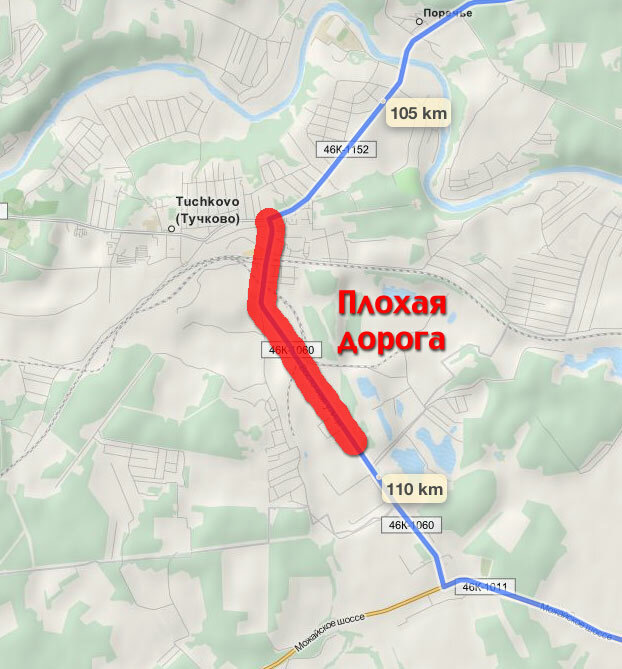 Road capitally repaired, it goes from Mozhaisk roadway to Tuchkovo. On Mozhaysk roadway it need to drive only 8 km. The road is very good, gave a more detailed description in the note about Mozhaisk brevet. 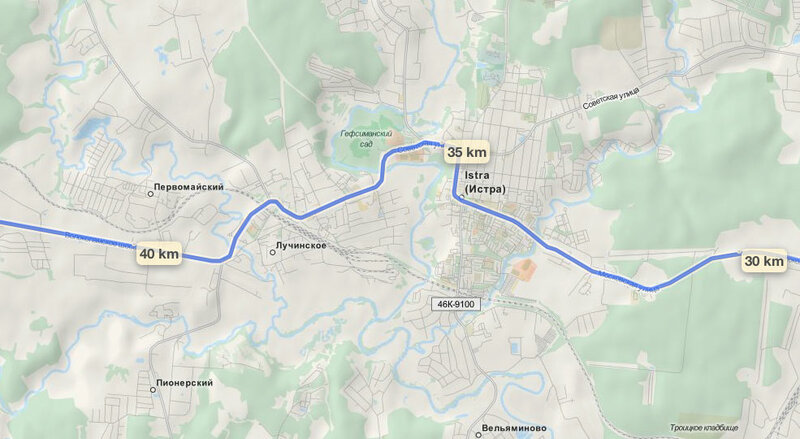 After turning left from “Mozhayka” it need to pass the industrial zone, apparently related to the Kubinka and then remains the way along the Moscow-River (125-th km). The road along the Moscow River can be divided into two areas. The first one from here (125-th km) to Zvenigorod, the second one from Zvenigorod to Moscow. The road itself is about the same, frequent hills and turns, with a good cover of road. Difference is in environment. 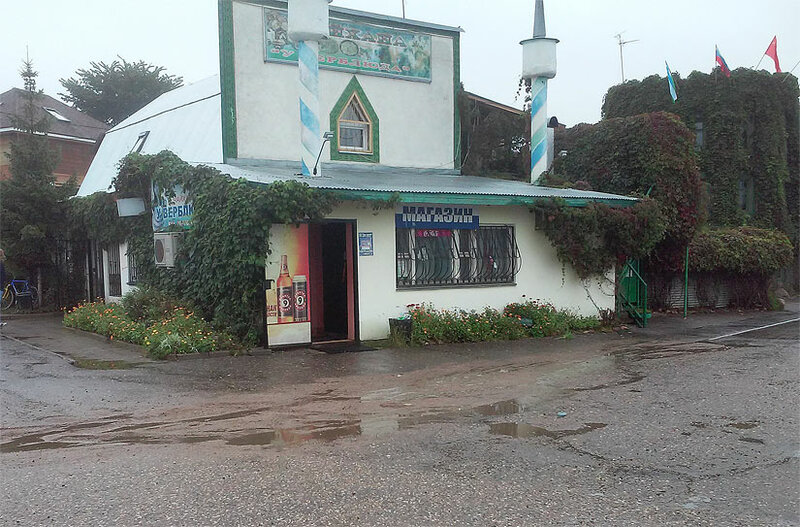 Before Zvenigorod it usual, people just live, and after Zvenigorod – resorts and “dacha” areas. CP-2 (138-th km, Volkovo) is near “the edge of Love” and also often serves as a stop for cyclists, code-named is “near the camel”. It is written in the shop, and near as I understand is small cafe. On 155-th km of travel go to “concrete circle” (A-107) to the left with the traffic light. Next you need to endure a 6 km of dense traffic of trucks. The road, too with hills and turns. In Zvenigorod hill rises fairly lengthy and steep. Tracks drives also slow, not chase. Then turn to the right (away from A-107) to the strange straight road of 6 km, not much different in traffic from the A-107. But on the 166-th km turn right and everything becomes as before, only this time for a very habitable and quite affluent areas. The impressive entrance to the village Nikolina Gora, about 170-th km. Immediately uphill appears, pretty cool. Still not very long, like all uphills in the route. Then a non-obvious turn left. The road follows the “dacha” village and is quite narrow. And it is necessary turn to even more narrow alley between deaf dacha fences. This is the beginning (or end?) of Ilinskoye roadway that leads straight to the Snej.com (All-year ski resort) in Krasnogorsk. Previous Previous post: Optimal cadence. Yes or no?